A sister, not in "my" order, told me last week that there is a problem in vocations about which I have never thought. This good head of her order told me that the younger ones coming in do not last in novitiate because of a lack of stamina. This point is very interesting. The sister told me that the Millennials lack the staying power or the ability to keep up with schedules. Now, this is in England. It would be interesting if I could find out if the same is true in America. Why would Millennials lack stamina? It is possible that their lifestyle is more sedentary. My generation did lots of physical labor: ironing, doing dishes, cleaning, cooking, shopping, taking care of younger siblings, walking to school, bicycling, etc. I think the lack of doing chores may be one of the things which creates a lack of stamina. Stamina may be learned when one does not get immediate results from activity. Here is a link from a group on the Millennials and the work ethic. Here are two independent sources. This present young generation do not have as much stress in some ways: they are surrounded by technology which does things easily and fast; they are not used to waiting for anything. The most wonderful thing for me in this house today, was the Perugino Institution of St Mary Major oil painting in superb condition. A small gem...no copy on the web that I could find. A true masterpiece. The second most wonderful thing was the collection of Meissen China dating back to the early 18th Century. 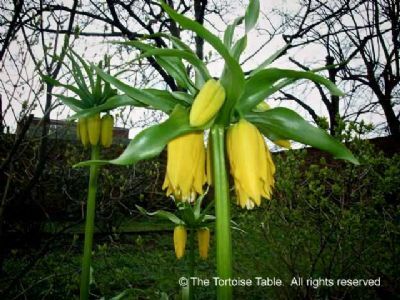 The third most remarkable thing were the Crown Imperial Fritillaries, truly magnificent flowers. If one can see into the flowers, one sees the parts which look like pearls. From experience and reflection, I want to share some thoughts on what Catholic identity is and is NOT. Bear with me while I outline a few ideas here. This is not an exhaustive list and much is repetition However, one cannot say these things too often. 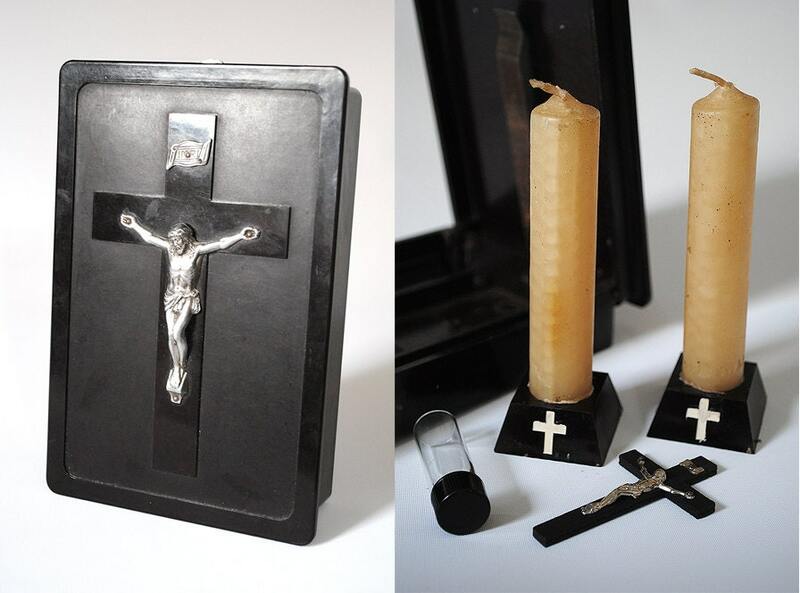 My mom used this and so did I and there was another one for Lent and Easter. Firstly, remember that I am old enough to remember what Catholic identity was in the 1950s and 1960s. I have a few posts on the old days of organized community and parish life which most people have never experienced. These ideals can be reinvigorated. 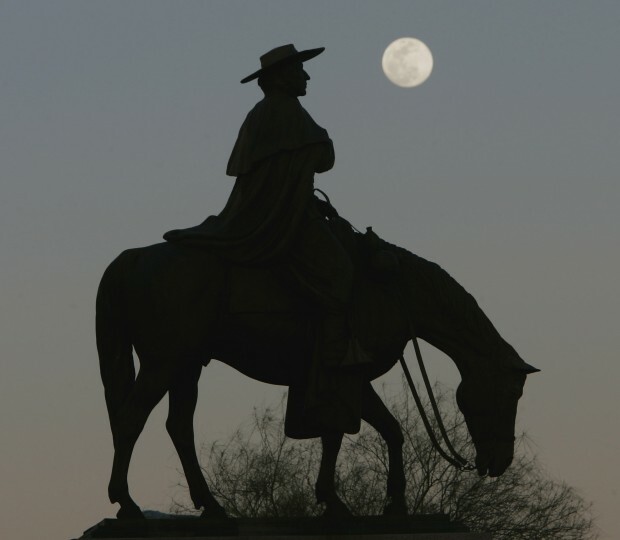 Everyone knew everyone in the 12% of Catholics in our city of 80% Lutherans and a few Presbyterians. The Catholic community was not only strong, but vigorous before Vatican II. Choirs, charities, youth groups, adult study groups, (yes, including Bible study), women and men's groups all happened before the seventies. Secondly, Catholic identity starts in the home. This identity takes work. 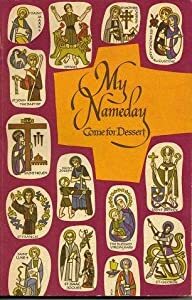 Sadly, so many converts who have never experienced mothers baking special cakes for holy days, or name days (saints' days) or having small home devotions do not know what this entails. Christmas customs have been largely lost, as well as Easter ones. 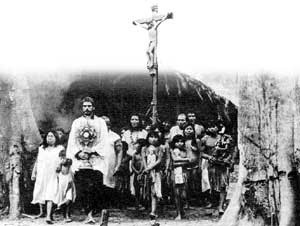 In the 1950s, the parish priest went from home to home and consecrated the families and house to the Sacred Heart of Jesus. Usually, there were pictures on the wall bought for this occasion one of the Sacred Heart of Jesus and one of the pierced heart of Mary. Because of the number of priests, the parish priests could visit houses for sick calls as well. We would meet the priest at the door with lit candles as he brought the Eucharist to the sick person. Every house had a sick call set, and I did as well. The family rosary was said in our house when I was young in October and May. This custom dwindled later on, but I remember this, and my son remembers his parents praying the rosary out loud at night when he was a baby. Catholic identity meant studying and my parents did this as well in parish groups. I remember the first meetings which involved using the St. John's Collegeville bible series (some are not so good, and some are). To say that Catholics did not read the Bible is a huge overstated lie. Fourthly, Catholic identity involved modesty, about which I have many posts, and also a decorum, about which I have written as well on this blog. Catholic children learned to be ladies and gentlemen. We were counter-cultural in our behavior. This was all part and still should be part of the life of the virtues for the formation of children. Fifthly, Catholic identity meant going to Confession regularly as a family on Saturdays. Daily Mass, if possible, and the awareness that the sanctifying grace of the sacraments was necessary for supernatural life was passed down from mom and dad. Sixthly, Catholic identity did NOT include dissent, but solemn questioning and examining and finally, conformity with the teaching of the Church at the adult level. It also involved missionary activity with the realization that we had to convert the world, as Jesus commanded. This was not seen as a option or non-politically correct attitude. What Catholic identity is NOT are these few points. Firstly, Catholic identity is not part time, but full time. One does not have a split personality of being Catholic at home and secular at work, for example. Secondly, Catholic identity is not an identity of negativity or argumentation. In other words, it is being for the Church and not merely against the prevailing culture or other religions. A person who identities themselves in negativity or argument will never grow spiritually. Thirdly, Catholic identity is not the proliferation of devotions, visionaries, medals or statues one collects, but a conforming of the mind to the mind of the Church. Too many people here in England (and some in Malta) think that in order to be Catholic one has to believe any new so-called revelations. Absolutely not. Even the writings of the visionaries who are saints are not infallible. Fourthly, Catholic identity is NOT automatic, simply because one's family is Catholic or one's surroundings. It is an interior disposition to holiness and putting on the Mind of Christ, which is the mind of the Church. As an Irish priest reminded me not too long ago, the Irish loss of faith was a long time happening owing to the lack of adult appropriation of the faith-no study and no effort leads to secular attitudes. 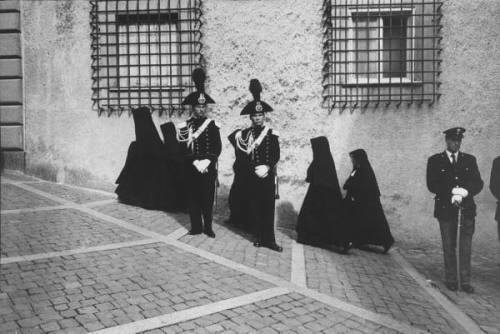 Nuns passing guards on the way to see Pope Pius XII’s body. Photograph by Mark Kauffman. Rome, Italy, October 1958. Lastly, Catholic identity is NOT being more Catholic than Rome. Extremist groups on both the left and right cannot be truly Catholic, as the Church is one, holy, true and apostolic, and therefore solidly balanced. To fall into liberal camps, such as being a socialist, which one cannot be and be Catholic, or to fall into far-right camps which add teachings to those of the Church, such as cultic dress or following false seers, are not part of Catholic identity but errors of modernism and gnosticism. I could add more points, but most of these things I have discussed here on this blog in the past. 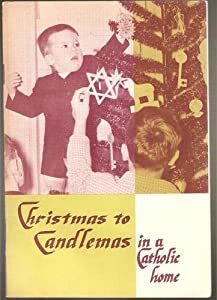 I shall only add that Catholic identity means teaching your children the Faith in season and out of season. "The CIA declined to comment Saturday." Duh. Three dead and 270 injured, many losing arms and legs and there is no comment. And, a heads up on this from Morocco-fatwas for Muslims converts to Christianity. And sexual slavery in GB...why? Is this a civilized country? Sexual slavery is condoned in the Koran. grey stones of the Fair Lady of the West Riding. tokens of love, like tickets at the gate. wanting the security of the arms of Mary. daughters to find themselves again. prayers and longings for God. the men in white robes. Skell, rippling in the wind.